Sustainable Technologies Business Acceleration Hub confirm speaker line up for low carbon innovation workshop in Bath. 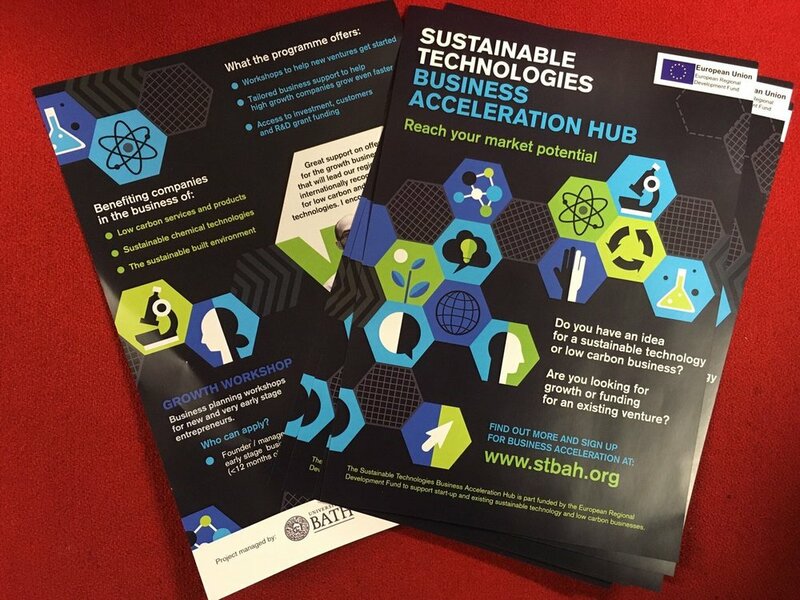 The Sustainable Technologies Business Acceleration Hub (STBAH) which is part funded by the European Regional Development Fund offers support to start-ups, scale ups / SMEs developing sustainable technology as part of their businesses. STBAH in partnership with Low Carbon South West have put together a series of free low carbon innovation workshops to provide initial entry points into the STBAH programme for relevant companies. Following a successful first workshop in Bristol on the Built Environment, the second one will be on Low Carbon Innovation in Energy Systems and will look at Themes, Trends and How to Get Funded. It takes place on Thursday 12th July, at The Innovation Centre, Bath, from 9am-12.30pm (networking opportunity and lunch 12.30-2pm) The speaker line up has been confirmed and it promises to be a very interesting and engaging event. 09.30: Introduction to the Sustainable Technologies Business Acceleration Hub. 09.45: From Economy of Scale to Economy of Flexibility - Opportunities in Low Carbon Transition: Prof Furong Li, Director, Centre for Sustainable Power Distribution, Dept Electronic & Electrical Engineering, University of Bath. 10.10: Technical challenges of the DSO transition: Oliver Spink, Network Strategy Engineer, Western Power Distribution. The expert speakers will discuss case studies of successful projects and offer advice on funding and grants. Prof Furong Li, Dept Electronic & Electrical Engineering, University of Bath. Prof Furong Li is the Director of Centre for Sustainable Power Distribution at the Department of Electronic & Electrical Engineering. She has been a Royal Society Wofson Merit Fellow (2013-2018), an EPSRC Advanced Fellow (2006-2011), and a Changjiang Scholar with Xi’an Jiaotong University (2016-2019). Her research sits between two major disciplines - electrical power and energy systems and market economics, concerned with fundamental development of new algorithms, economic theories and analysis tools and their application to smart energy systems, smart markets, smart homes and businesses. The applications span from community energy system through regional to national system to promote efficiency, sustainability and security in energy generation, distribution and consumption. She is leads 2 bilateral EPSRC sponsored consortia in smart grids UK/India HEAPD and UK/Korea Peer-to-Peer Energy Trading and Sharing and an industrial project into Future Structure of Distribution System. She has undertaken research and consultancies for the UK government, the energy regulator for the UK- Ofgem and Brazil - ANEEL, NPower, Centric, all the UK’s 7 transmission and distribution licensees. She is the co-Director for EPSRC Supergen Energy Hub responsible for Markets and Regulation, chairs the International Working Group for Distribution Pricing and Tariffs (USA), and is an executive member of the IET Power Trading and Control network (UK). Oliver Spink, Network Strategy Team, Western Power Distribution. Oliver Spink is a Network Strategy Engineer at Western Power Distribution. After obtaining a MEng Electrical and Electronic Engineering degree from the University of Manchester in 2015, Oliver joined Western Power Distribution’s graduate scheme and has progressed through the business covering a number of different functions, including network maintenance, primary network design and connections policy. As part of the Network Strategy team he has focused on guiding the long-term strategic development of the network. As part of his role, Oliver develops and analyses long-term scenarios to identify strategic investment requirements on the distribution network. Oliver led the development of WPD’s Distribution System Operability Framework. A UK first, this report identifies the technical challenges facing DNOs as they make the transition to become DSOs and support the development of a low carbon future. Peter Dennis, Smart Grid Aggregation Analyst, Ecotricity. Having a background in Physics and Renewable Energy Engineering, Peter joined Ecotricity in 2013. Since that time Peter has performed a variety of roles with experience of renewable subsidies, consultation responses, energy trading, procurement and financial modelling. Now in the Smart Grids team, Peter is tasked with bringing generation and storage assets into their Smart Grid/VPP and winning contracts with the TSO and DSOs that will allow Ecotricity to provide services to the network. Dr Jim Totty, Managing Partner, Sustainable Technology Investors Limited. Jim joined Sustainable Technology Investors Ltd (“STIL”) in 2011 after previously working in private equity and energy roles at Citi, PricewaterhouseCoopers and earlier in academia. He invests in sustainable technology, services and manufacturing businesses, and asset development platforms. STIL manages family office capital, institutional funds, and high net worth investments through private equity funds. STIL focuses on growth capital and venture capital investments, and on sustainable infrastructure. Jim is a Chartered Financial Analyst and holds an MA in Physics from the University of Cambridge, and an MSc and PhD in Physics from Imperial College London. Sarah Eager, Innovation Lead, Smart Infrastructure, Innovate UK. Sarah Eager is an Innovation Lead in the Smart Infrastructure team at Innovate UK, heading up the Built Environment Platform. Sarah previously worked for 6 years in the UK and Australian energy industry within operational and policy roles across smart metering, retail/wholesale markets and demand side response. Sarah began her career in commercial and residential energy efficiency and is a Renewable Energy Engineer by trade. St. John Hughes, BSc MSc, Avenir Energy. St. John comes from a background in environmental consulting. More latterly he's been developing renewable energy projects, notably utility scale solar. Success in the energy sector has enabled him to explore and invest in innovative projects at an early stage of their formation. His interests are predominantly in 'cleantech' , mainly involving startups working on energy optimization; energy efficiency; community energy; carbon / emissions analytics & indices; LED tech. He's also involved in projects working on enhanced compute capacity, and mobile software. He is a non-exec / board member of some; an observer to the board of others; and otherwise an investor who likes to help where he can. He's widely traveled, and is drawn to opportunities that have potential for giving rise to systematic change for the better, environmentally and socially. Dr Izaro Lopez Garcia, Industrial Partnerships Manager, University of Bath. Technology Transfer Professional with a passion for commercializing innovations and new technologies with 12+ years of experience in project management and business development, 8+ years dedicated to European funding scheme projects and technology transfer initiatives. Izaro has worked in technology transfer, project management, technology assess­ment and international strategy for over 12 years. He has taken part in cooperative research projects, from definition of project concept; proposal preparation, budget generation and liaison with the European Commission Officials responsible for the implementation of the various programmes. He has engaged extensively with SMEs across the EU and provided advice and support to SMEs in accessing SME Instrument grants. Izaro has also participated in Pre-Commercial Procurement initiatives as part of the EC work programme, coordinating projects on behalf of the Department of Health of Catalonia, Spain. He is currently developing, delivering and managing a portfolio of technology transfer programmes accomplished through strategic industry partnerships, providing collaborative and contract research, Knowledge Transfer Partnerships (KTP), Horizon 2020 funding tools and consultancy for the University of Bath, including the creation, formation and stewardship of Spin-outs and Start-ups. In his time with higher education institutions, he provides workshops and learning activities to SMEs on impact and commercialisation activities as well as exploitation and internationalisation of project results. His particular areas of interests are: Nanotechnology and Materials, Space, Nuclear & Radiation Technologies and Information and Communication Technologies. Please visit the STBAH website for further information. Register here for the Low Carbon Innovation in Energy Systems workshop taking place on Thursday July 12th from 9am - 12.30pm (networking lunch from 12.30-2pm) at the Innovation Centre, Bath.